The four shortlisted sites for the 2019 landing are located in features named Mawrth Vallis, Oxia Planum, Hypanis Vallis and Aram Dorsum. 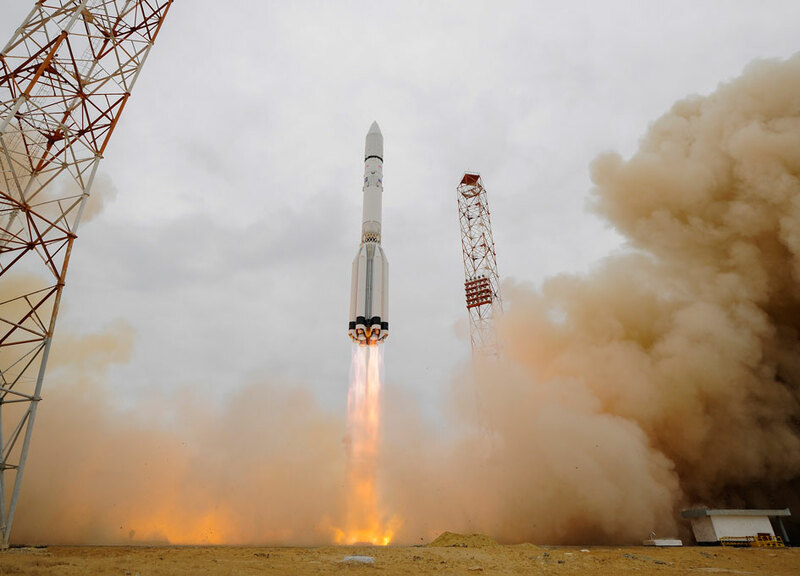 ExoMars is a joint two-mission endeavour between ESA and Russia's Roscosmos space agency. The Trace Gas Orbiter and an entry, descent and landing demonstrator module, Schiaparelli, will be launched in January 2016, arriving at Mars nine months later. The Rover and Surface Platform will depart in May 2018, with touchdown on Mars in January 2019. 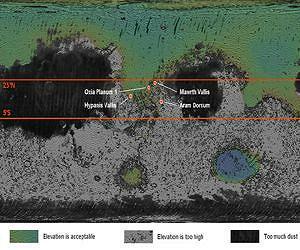 Oxia Planum has been recommended as the primary candidate for the landing site of the ExoMars 2018 mission. 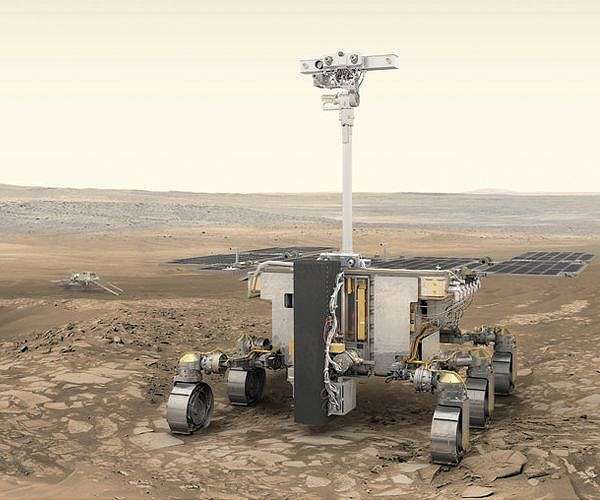 ExoMars 2018, comprising a rover and surface platform, is the second of two missions making up the ExoMars programme, a joint endeavour between ESA and Russia's Roscosmos. Launch is planned for May 2018, with touchdown on the Red Planet in January 2019. Meanwhile, the Trace Gas Orbiter and the Schiaparelli entry, descent and landing demonstrator module will be launched in March 2016, arriving at Mars around this time next year. Schiaparelli will land in Meridiani Planum. The orbiter will study the atmosphere and act as a relay for the second mission. The main goal for the rover is to search for evidence of martian life, past or present, in an area with ancient rocks where liquid water was once abundant. A drill is capable of extracting samples from up to 2 m below the surface. This is crucial, because the present surface of Mars is a hostile place for living organisms owing to the harsh solar and cosmic radiation. By searching underground, the rover has more chance of finding preserved evidence. Scientists believe that primitive life could have gained a foothold when the surface environment was wetter, more than 3.6 billion years ago. Buried or recently exhumed layered sedimentary deposits thus offer the best window into this important period of Mars history. The primary goal of the ExoMars programme is to address the question of whether life has ever existed on Mars. This relates to its name, with the 'exo' referring to the study of exobiology - the possible existence of life beyond Earth (sometimes also referred to as astrobiology). The programme comprises two missions. The first was launched today and consists of the Trace Gas Orbiter (TGO) and Schiaparelli, an entry, descent and landing demonstrator module. The second is planned for launch in 2018 and is a rover and surface science platform. The 2018 rover that will carry a drill and a suite of instruments dedicated to exobiology and geochemistry research. Schiaparelli is really just a 'technology demonstrator', designed to show that Europe can put a craft down safely onto the Martian surface. 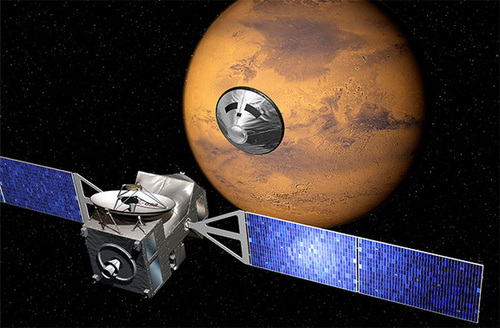 But the rest of ExoMars 2016, the Trace Gas Orbiter, will try to map the production and concentration of trace gases like methane in the Martian air. As we've talked about, methane can arise from celestial events, surface geological events (volcanology, tectonics), or from past and/or present life. In my paranoid mind, I've developed the notion that we hear no more about Mars from NASA than NASA wants us to hear. To me, it's the only way to explain little things like the "discovery of water" on Mars about 8 times in the past 10 years or so. Whether or not ESA will treat us the same way remains to be seen. ExoMars mission has good odds of finding life on Mars if life exists. upon landing, the rover will drill two meters into the Martian surface in order to reach the depth which "has been protected from the harsh conditions on Mars" and extract soil samples that, hopefully, may contain "bacteria that can break down molecules." ESA's Mars rover has a name - Rosalind Franklin from over 36 000 entries submitted by citizens from all ESA Member States, following a competition launched by the UK Space Agency in July last year. "We want to bring the Red Planet closer to home. We want to delve into its mysteries and bring back knowledge and benefits to people on Earth. Returned planetary samples are truly the gift that keeps on giving - scientific treasure for generations to come," he adds.